Below is an article Tom published on his LinkedIn page on November 9, 2016. Change multiplies uncertainty. Now, as greater uncertainty comes into play, US Citizens and International Investors seek ways to hedge existing bets on the direction and volatility of the US and World economy. The labyrinth of unknowns instantly created by the results of the latest election cycle have brought “thoughtful pause” to many of us looking for a safe, solid ROI and a high quality of life today and through our retirement years. After being blindsided by bubbles and bailouts, we seek presently-undervalued real assets that will maintain or increase their value despite, or as a result of, the ups and downs around us. 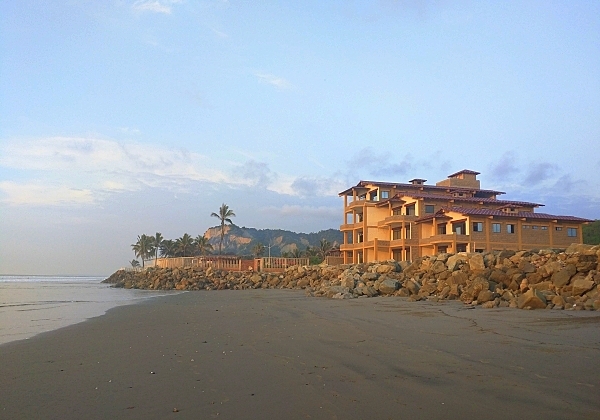 Ecuador has been described as Costa Rica with real estate prices 40 years behind the curve. Ecuador recently received a HUGE upgrade in terms of infrastructure (new roads, new hydro plants, new refinery, new airport) and international recognition as the world’s highest-value retirement destination by CNBC, Forbes, International Living Magazine and the New York Times. The official currency of Ecuador is the US Dollar and its two main cities of Quito and Guayaquil are a short (4 hour), direct flight from Miami or Ft. Lauderdale (via Jetblue). 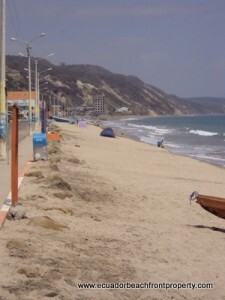 Ecuador’s time zone coincides with either EST and CST depending on daylight savings time in the US, making it a viable base for the digitally mobile worker. 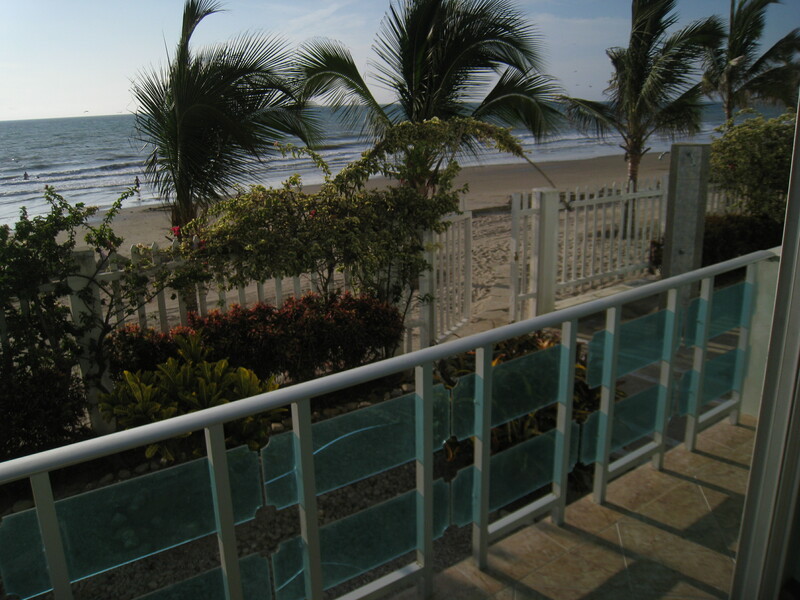 For those looking to move down soon or buy now and rent until retirement, beachfront condos can provide exceptional value and appreciation. New condo projects are just beginning to become available for the forward thinking retirees and investors along the beaches just outside of the busy cities. 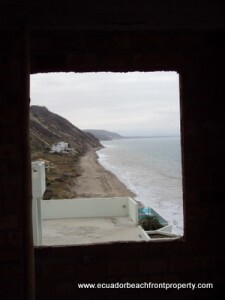 One example is our Ensenada del Pacifico project located in San Clemente, Manabi that is now nearing completion. Demand for the first phase of the project was strong and only two units are available as resales at only $154,000. The majority of the project was sold prior to completion. With the ups and downs of the US and World Economy, purchasing tangible assets in Ecuador in the form of land, investment, or an income-producing vacation property that is presently well-undervalued in the global market might be just the right move for you. 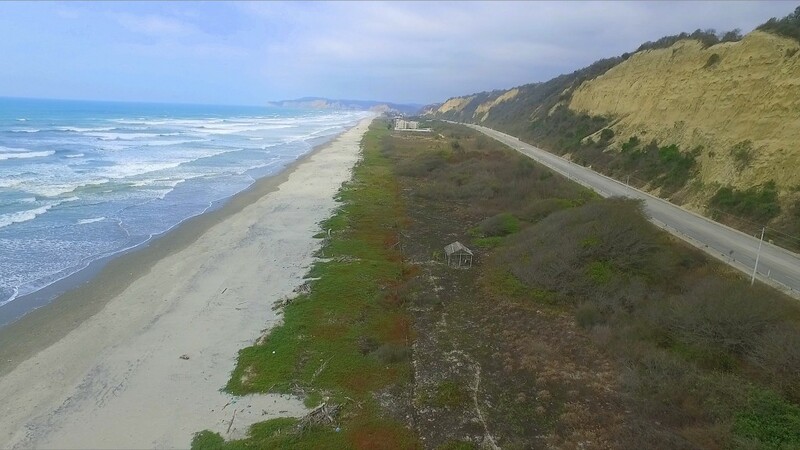 Beautiful yet inexpensive beachfront lot – only $11,500! People often ask what our least expensive beachfront land sells for. Well, the answer is $11,500. In fact we currently have 2 adjacent beachfront lots listed at this low price. Each lot is 10 meters wide by 20 meters deep for 200 sq m or 2,152 sq ft total. 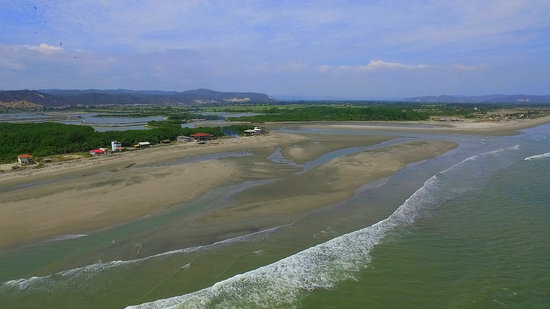 These beachfront lots are located on the southern end of the quiet fishing town of San Jacinto. The lots are perfectly sized for building a small beachouse or to keep as an investment for the future. 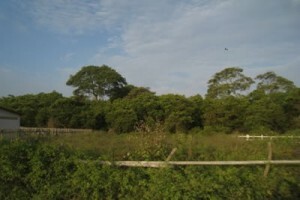 The lots back up to small a biological reserve and are about a three minute walk to the Portoviejo River. We are asking $11,500 for each lot or $22,000 for the two together. You’re looking at a price of a little over $5 per square foot of beautiful beachfront land! Imagine finding those kinds of deals nowadays in Costa Rica or Panama! Consider investing in Ecuador while the prices are still so low! Something New: Ecuador Video Discount Guides! 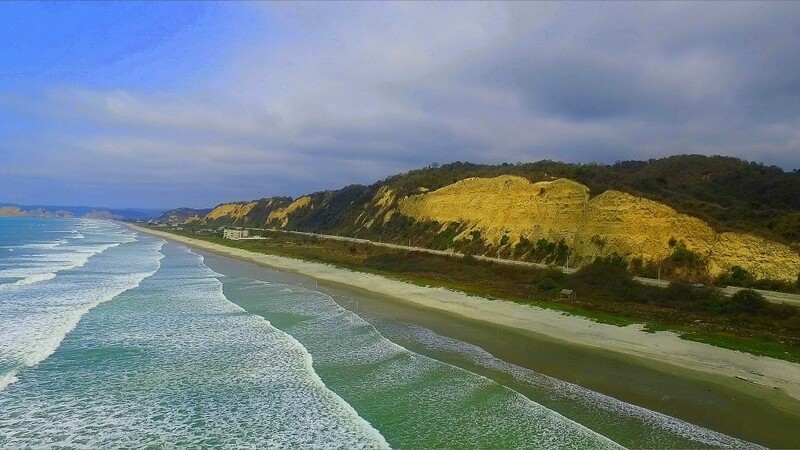 We have traveled the central coast of Ecuador (Manta to Canoa), negotiated special deals with hotels, restaurants, tour companies, shot hours of footage, and put together an essential resource guide. 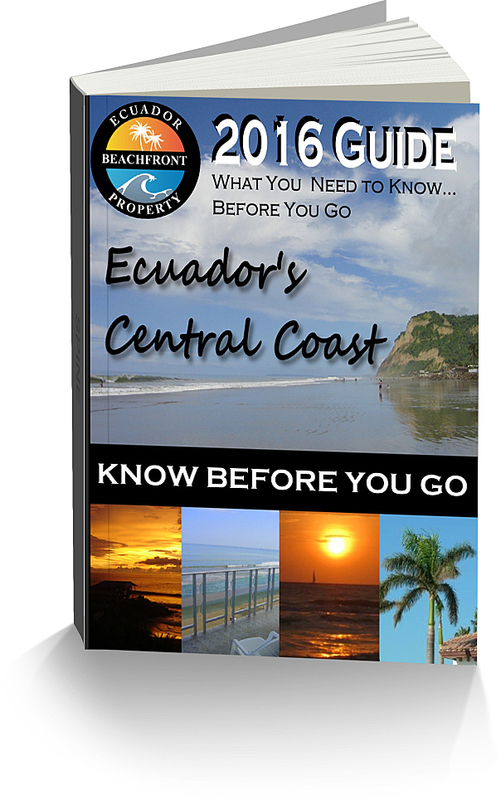 We’ve condensed all this great information into one, instantly-downloadable Video Discount Guide Package so you can Get To Know Ecuador faster and more efficiently than anywhere else! 10-20% off at excellent seafood restaurants and bars… to name just a few. Check our webpage now to get the special $10 off intro price.